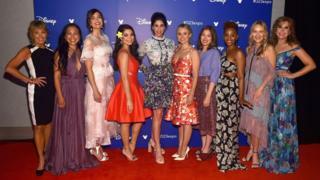 As proof that you can be a princess when you grow up, the voices behind 10 of Disney's cartoon princesses have gathered at a US event for fans. John Lasseter, Disney and Pixar's chief creative officer, said at Sunday's Disney expo in California: "These characters are really strong... We love to think of them way beyond just the movie that was made." Irene Bedard, who played Pocahontas in 1995, said the princesses would be moving with the times. She told Variety magazine: "We can say this is the story that was told - but now we have a chance to take it into our hands again and have princesses with a twist. "For me, being a princess means really being able to know to listen to your heart and have that voice - and speak out when we all should have that chance." Disney, which has faced questions over the impact its princesses might have on young girls' ideas of perfection, has more recently attempted to rework its on-screen heroines. Moana featured a princess with an "average" body type, while this year's Beauty and the Beast portrayed Belle as an inventor.